For those of us who love interior décor, there's nothing more fun than trendspotting. You never run out of things to look at, things to love, or things to want for your own home. Design trends can inspire you, change the way that you look at your rooms or even help you find new ways to express yourself. But the best thing is that every now and again, you come across a trend that actually surprises you. One of the newest trends in the world of interior decorating is bright, illuminated neon signs. These incredible signs are the perfect way to give your home an unexpected look. Whether you want to calm your space with a soft white light or make a statement in hot, bold pink, these signs are the perfect way to make your room say what you want to say. Not only do these signs look wonderful, but they also work in more spaces than you might think. Bedrooms, dining rooms, nurseries, and even bathrooms are the ideal places to showcase these trendy and beautiful new elements. Using neon signs as a form of wall art really gives a space an unexpected element of interest. It’s non-traditional, and that’s what makes it fun and quirky. We love how this space incorporates an “Oops “ sign in the left corner of the room. It's funny and charming while adding a chic finishing touch to this classic black and white color palette. If you're going to make your walls talk, why not give them something to say? Using a light, bright neon sign on a dark wall brings a wow factor that is excellent for bringing attention to a classic quote, famous saying or even a personal motto. Creating a dramatic contrast between the colors is sure to make the sign pop within the space. And while there's no clearer contrast than black and white, don’t be afraid to try other colors. With a neon glow surrounding it, any bright color will look great on a darkly painted wall. Neon-lit signs don't have to be a small accent in your space. They work equally well when they're placed center stage. It’s an especially nice option for incorporating something subtle, like a small white sign against a crisp white wall. Or, you can do something large, bold, and bright. There are so many options that can be catered to suit your tastes. Using these signs as a focal point is also great because it is a different alternative to the more traditional options of art and pictures. 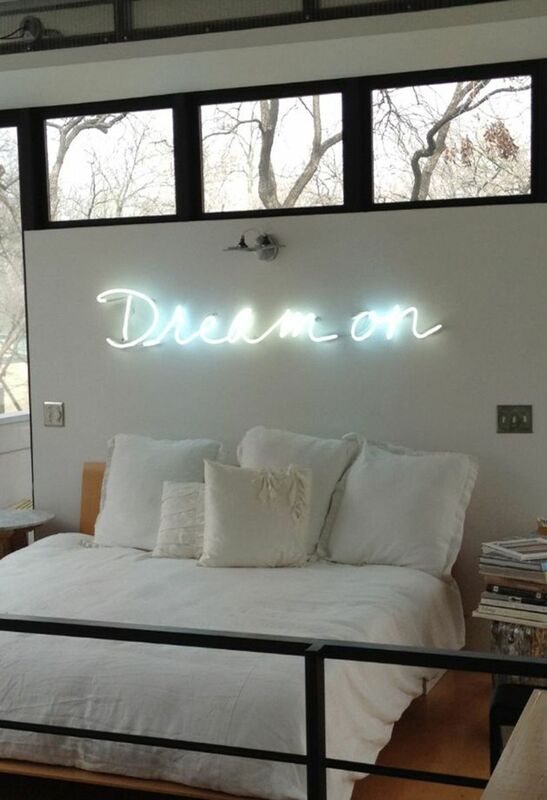 In this photo, we love how the sign is centered above the bed; you don’t even need a headboard! If you’re not set on incorporating one of these signs into your home permanently, try adding one or two when you’re entertaining. Themed pieces like this “Enjoy” sign hung over a refreshments table make the perfect addition to a tasty cocktail party or a Sunday brunch. If you're looking for something a little unconventional to add a pop of bright, bold color to your favorite room, these signs might just be the way to go. With the walls and the furniture, this space is a bit more neutral and industrial looking. But with the addition of this warm and lively pink heart, the space wakes up and is completely transformed! Putting words on your walls can open up a whole new range of creative possibilities. Go beyond hanging catchphrases and literally put words into the mouth of your favorite furniture pieces. This cute little bar cart becomes even more adorable with this clever and charming sentiment. Want to try the white signage on a white wall, but don't have a flat white wall to work with? No problem. This combination is subtle and simple and so nearly hidden that you have to look a bit to catch it. As a result, it works to add a bit of texture, even to an already layered surface. A neon sign is a beautiful addition to a child’s nursery or bedroom. Using warm colors to display a name, a nickname or just a happy thought creates a special place that your little one can feel is all their own. This is an incredibly non-traditional, but unbelievably cool way to incorporate this signage into a space. Who wouldn’t love spending bath time under their very own set of fluffy white neon clouds? Sam Schriemer is a design-obsessed textile designer living in Toronto, Canada. Her love of color, modern textiles and vibrant spaces can all be explored on her interior design and lifestyle blog, Sam Schriemer Design & Lifestyle.